We moved here last October, we had outgrown our old house. Our new garden is much larger (and flatter) than the one we had before but it needs some work. Last night we had someone round to give us a quote for a new patio. I am so excited, by mid April we should have a nine metre by four metre patio for the children to play on. We like to play outside all year round but sometimes the grass just gets far too soggy. Last weekend I cleared the flower bed in the front garden. 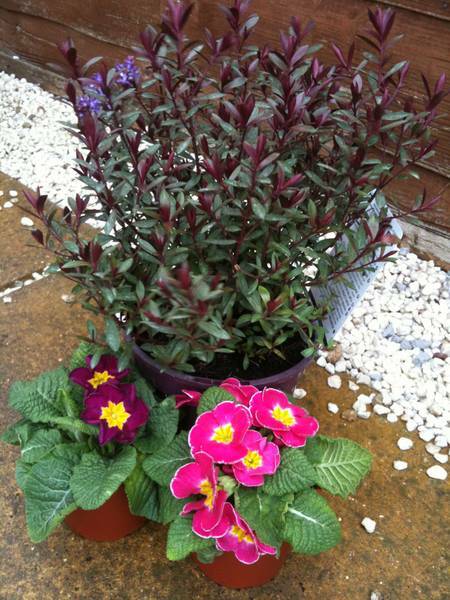 On Wednesday we visited the garden centre in Burton Latimer to buy plants. The children each chose a Primrose which they planted today. Our free seed potatoes from the British Potato Council have arrived, we'll plant those in March. We're going to have a go at growing tomatoes in a planter on the patio. I fancy trying to grow pumpkins, has anyone tried? I've read they take up a lot of ground space. The children would love to be able to carve home grown pumpkins at Halloween. I'm not sure my green fingers are up to the challenge! Long term I would love to have a sheltered/undercover area outside too. I'll have to start saving! Labels: Days out, In the garden, Newsletter items for parents of children in my care.